Thinking of Buying a New CNC Machine Tool? Repurposing money for a new machine into helping fill the manufacturing skills gap is a wiser move. With a huge portion of this industry retiring from the workforce within the next decade, the loss is definitely being felt. With a younger workforce slowly coming on board, the solution may seem to be to invest in newer equipment, similar to what the new work force is bring trained on. The issue here is that buying a new machine, which can cost five to six figures, especially more if you are investing in multiple machines, is money that is being spent on tools. What about the people who work on the tools? Especially if you are leasing new equipment, it will be hard to pay it off with less of a work force. 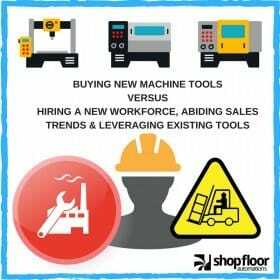 The best strategy would be to spend thousands of dollars not on new machine tools, but on a new workforce. Giving them solutions to make legacy machines operate more smoothly has the potential to help production surpass goals, as well as keeping the Made in America manufacturing workforce afloat. New machine sales haven’t been prevalent in over two years. According to EDA, a data-driven market insight company, there was a huge spike in buying or leasing new machines between 2000 and 2001, with a minimum of 2k machines sold per month between August 2000 and January 2001. February 2002 was when new machine sales/leasing finally dipped below 1k units per month. This event seemed to trigger a trend for low sales of new machines until October 2003, when sales started to recover. Sales and leasing of new machines hit a healthy stride until January of 2009, sales significantly dropped. Since that point, sales and leasing of new machines has been up and down – new machine sales or leasing has not surpassed 2k per month since December of 2014. Sales or leasing of used machines has always been consistent, and even surpassed new machines once in 2001, for half of 2002, more than half the year in 2003, once in 2009 and once as recently as October 2015. Leveraging the tools you already have saves time and money. Adding supplements to the tools and equipment you already have will save you precious time, teach you new skills, plus the benefit of money being saved by not buying new machines or losing production time by staying with what you have and not changing it. Time spent by manually tracking data or using spreadsheets for job scheduling can be replaced with machine monitoring or graphical schedulers. Instead of hoping programs send to machines or dealing with programs too large to download to machines, use DNC software to drip-feed (it will also save you the time from going back and forth to the PC, or bringing your laptop all around the shop). If you are constantly replacing cabling due to a caustic shop floor environment, maybe now is the time to go wireless. If you are interested in more info, we invite you to give us a call or fill out a form so we can get back to you at your convenience. Call (877) 611-5825 and make the most of your New Years shop floor resolutions today!